One of Beaune’s medieval treasures is the Hospices de Beaune or Hôtel-Dieu, a hospital that was built for the poor and needy by Nicolas Rolin and his wife, Guigone de Salins, in 1443 after the Hundred Years War. The Hôtel-Dieu’s striking geometric glazed-tile roof make this a stand-out external feature of the building. The courtyard is the best place to admire the tapestry of interwoven red, green, brown and yellow glazed tiles. This style of roofing went on to quickly become a landmark of the architecture from Burgundy. The inside is equally impressive, especially the Great Hall of the Poor with its 28 four-poster beds. To the visitor today, the red-curtains and soft light make the Great Hall look like a luxurious hospital ward, but at the time, it would have been filled with destitute patients, having to share the use of the beds. The rooms in the Hôtel-Dieu, named after Saint Anne, Saint Nicolas, Saint Hugues and Saint Louis, are filled with treasures – statuary, furniture, the pharmacy filled with ceramic pots of potions, paintings and tapestries. In the kitchen is a Gothic fireplace with a dual hearth and mechanical spit which was made in 1698. 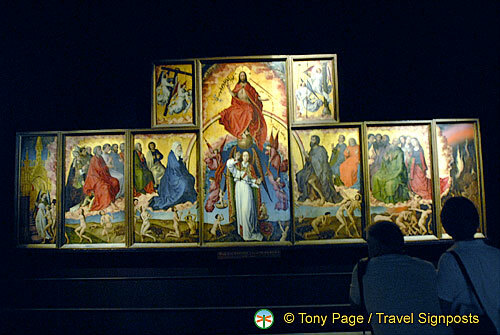 Do not miss the world-famous altarpiece – the polyptych of “The Last Judgement” by Flemish painter Rogier Van der Weyden. The Treaty of Arras (1435) marked the reconciliation of Philip the Good, Duke of Burgundy, with Charles VII, King of France. With it came the end of the Hundred Years War which left many regions in a disastrous situation. With the pillaging of the land by brigands, peasants had to seek refuge within the walls of towns and fortified chateaux, thus abandoning their crops. This resulted in a great famine. At the time, Nicolas Rolin was Chancellor to the Duke of Burgundy. Born a petty bourgeois from Autun, he became a lawyer and ended up as one of the most powerful and wealthiest men of his time. Touched by the people’s misery, he and his wife Guigone de Salins, decided to build a hospital. Pope Eugene IV issued two papal bulls (proclamations) authorizing the founding of a hospital and granting various privileges and indulgences. The Duke of Burgundy also contributed to this cause. In letters patent written in 1442 and 1443, he exempted the future hospital from taxation and authorized that all wood needed for its construction could be taken from his forests. "The Last Judgement" by Rogier Van der Weyden.. In 1443, with the support of the Pope and the Duke of Burgundy, Nicolas Rolin solemnly dictated the Charter founding the Hôtel-Dieu. This Charter, approved by the papal bull issued by Pope Pius II, governed the life of the hospital for five centuries. Over the centuries Nicolas Rolin’s Hôtel-Dieu has been emulated by grateful families and generous benefactors in other towns and villages in Burgundy and the Hôtel-Dieu is one of the best and oldest examples philanthropy. Each year, on the third Sunday in November, a charity wine auction takes place as part of the Les Trois Glorieuses festivities in Beaune. 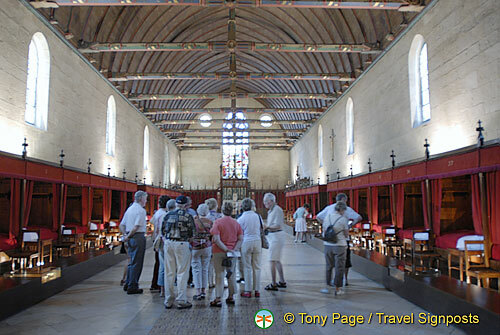 The Hospices de Beaune or Hôtel Dieu is open all year round and is certainly worth a visit. See Hospices de Beaune photos with Travelsignposts. Its really Grate -Hospices de Beaune.